Did you know you can now order your Deliveroo takeaway from Hala here on View? 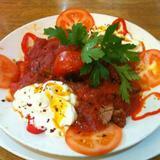 Harringay's Hala is a traditional Turkish eatery that serves a wide variety of authentic meals and drinks. Do you work at Hala? What did you think of Hala? There are plenty of Turkish options in these parts, but it’s appropriate that ‘hala’ means ‘auntie’: the restaurant has long been a favoured source of comfort for Harringay locals. Overall, the look is a typical eat-in-or-take-away Turkish ocakbasi. The frontage to the street is narrow, but the place’s name is in big bold blue lettering: HALA. Give it an exclamation mark and it would look like a transcribed yell. Ladies in the window manipulate dough into gözleme and manti, one of the restaurant’s specialities. 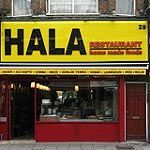 So if ‘hala’ is Turkish for ‘aunt’, what kind of auntie would this restaurant be? Easy: it’d be the one whose house you actually used to really like visiting: warm but not too chatty, with an abundant larder. It’s partly down to the way the menu works just as well for taking away as for eating in, but there’s a casual, mi-casa-es-su-casa feel to the place. Banter and smiles between staff and customers give it the feel of the family kitchen in an old Bisto advert. Customers waiting for takeaway are offered tea while they wait. 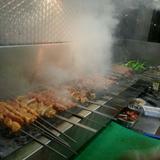 Others are there for the long haul, getting through starters and great platters of mixed kebabs, then coffee and baklava. The staff are snappily dressed and transmit a confidence which comes, perhaps, from knowing they’re part of a well-oiled operation. They never seem rushed, and yet dishes arrive in timely fashion. Like many a favoured auntie, this place manages to be different things to different people, and to do them all well. Immediately on entering you’ll notice a brightly lit display counter that shows off that day’s pre-prepared dishes. There might be a pasta bake, topped with a great puffy layer of béchamel, alongside a chicken stew or slow-cooked lamb shank. Keep an eye out for kleftiko, a Greek-sounding dish that evokes the period Turkey ruled that country’s roost. All are around £7, and served with rice and salad. Ask for a mix and you’ll be served a truly eye-smacking plateful of food. The next display counter along is ranked with prepped kebabs, their meatiness tempered by rows of tomatoes, lemons, parsley and peppers. Slapped onto the grill these spears form the main event of many meals at Hala. From lamb and chicken sis to adana and beyti, chops and ribs. The beyti kebab dishes come with yoghurt. That’s Turkish yoghurt, too, which is improbably rich. Recommended is the alinazik kebab – finely chopped lamb sis with grilled aubergine and yoghurt. Kebab prices run £8-£10.50. That’s with a great portion of salad on the side, too. Chopped mooli and lettuce temper the richness of the meat perfectly, while baskets of soft-but-chewy Turkish bread are laid on for juice mopping. There’s quail, too, plus sea bass and sea bream. Of course, there are starters to consider. It’s hard to see beyond the excellent mixed meze. Here, hummus, tarama, cacik and aubergine salad (patlican salatasi) take up the four quarters of a plate, with the odd bit of crunchy raw veg, olives and white cheese scattered about for good measure. A dish of refreshing, slightly hot ezme is served on the side. Your taste buds will hardly have known such a going over, and all for £5.50. Recommended amongst the hot starters are the soups (£3.50), amongst which the simple lentil version shouldn’t be ignored, and the fried liver with a tangy side of onions and parsley (arnavut cigeri - £5). Many people come for takeaway, primarily pide (£6.50-£7) and lahmacun (£2.50). For dessert, look to the tubs of browned rice pudding in the display counter, or bank on a chunk of complimentary baklava or Turkish delight with your after-dinner tea or coffee. The yoghurt drink ayran comes from a vat that wouldn’t look out of place in Willy Wonka’s factory. They pour it then spoon froth on top. For beer there’s Efes and Stella Artois (£3). Spirits include some Turkish varieties and Turkish wines run from £3/glass, £13/bottle. The food served here is abundantly generous for what they charge. It really is like a benevolent auntie trying to feed you up. At this price point, Hala is hard to beat.